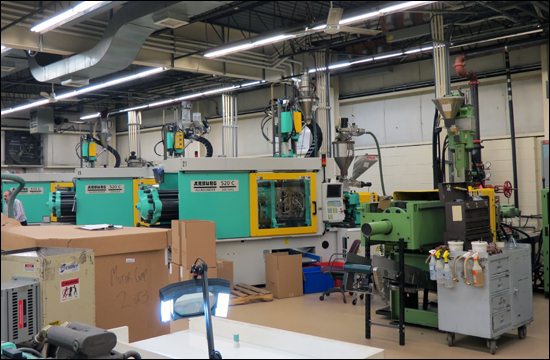 Northeast Mold & Plastics, Inc. recently completed a job in which it used injection molding to replace a metal part with plastic in a high-heat-and-moisture application. Although the metal part had been able to withstand the high-temperature environment, it had failed in corrosion testing, thus necessitating the metal-to-plastic conversion. Replacing the metal part with plastic meant that the company would need to build an injection-mold tool and provide molded parts for the same total cost as just the metal part. According to Maury Bodeau, Northeast Mold & Plastics used its highly sophisticated machining centers and experienced toolmakers to build the tool and meet the customer's delivery date for production parts. "The customer was looking for his tooling investment to be returned to him on the first production order," said Bodeau. "We also had to look at cost savings beyond the initial purchase order." The company responded by building a two-cavity mold in a four-cavity frame. "By only cutting the first two cavities in year one of the project, we were able to stay within the program's tooling/parts budget," Bodeau explained. "In the second year of the program, if the customer wanted additional savings, the last two cavities could be completed." According to Bodeau, the metal-to-plastic conversion was a formidable challenge that required much more than simply "drawing the part over and saying, 'make it out of plastic.'" Certain areas of the metal part that did not lend themselves to plastic injection molding needed to be redesigned, he noted. Then, through the use of CAD software, the company was able to simulate the functionality of the part and make the necessary changes prior to starting the tooling. Building the full-production, injection mold tool to the SPI 101 classification also represented a significant challenge, Bodeau said. The tool was a cam-operated, hot manifold tool that featured a self-contained, "A" series mold base manufactured from #2 steel. It incorporated a Mold Masters hot manifold and gating system; H-13 tool steel cores and cavities, hard and ground to 50-52 Rc; and S-7 and A-2 steel cam assemblies, hard and ground to 50-56 Rc. The tool also had cam assemblies, actuated by hydraulic cylinder; pin and guided injection; a positive return system; and parting-line interlocks. Northeast Mold & Plastics performs pre-production prototyping and complete production of thermoplastic parts that require critical tolerances. The firm services OEM companies that manufacture business, printing, and electronic equipment, filtration devices, and fluid valve, medical, and automotive components. The company also provides secondary services, such as sonic welding, pad printing, and silk screening.